We heard that a fellow in Punta Gorda (Fl), named Harry Goulding was turning out a lot of good seedlings -- in fact, he was taking over from a fellow named Rittenour who we had previously visited while passing through the Daytona Area. We jumped in the car one Saturday morning and headed for the west coast. We found Harry in his shed behind his house working with his seeds, as it was time to think of planting. After a few cold beers, he explained to us about his "stud book", a 5x10 hard cover notebook in which he kept records each year. He showed us pages of all his crosses and the results. He first advised us that "a throwaway seedling is as important as a keeper. If a parent keeps throwing throwaways, then throw away the parent-- regardless of how great a seed setter it might be." Secondly, Harry advised that "you should always have a goal in mind and breed toward it." When we first talked with him he was striving for a gold and along came Devil's Gold. Shortly thereafter, he wanted a large double that he could name for his wife, and he got Lovely Rea, a seven time best of show winner. Before leaving, he advised us that you "only hybridize in Florida between October 15 and April 15". He and one of his friends tried 1500 crosses during the middle of summer and got zilch. Next, we traveled to Vero Beach, Fl, to visit with a couple of Harry's protégés, Norman Brubaker and Vance Walker. They were following Harry's advice and were trying for a brown bloom and after a few years, they came up with Beverly B. Their advice to Roberta and me was to "use only well foliated and erect bushes as parents. Poor bushes like Grey Lady, Cameron et al may give pretty blooms, but the bushes and frequency of bloom will not keep them around too long." Our next sojourn was to Palm Beach to visit Carl Wilbanks. Carl advised us on how to mark our crosses. He used a 1x3 white price tag on a string. With a marking pen, he wrote in the cross and then looped the tag around the stem of the bloom. If the cross failed, he marked it off and used the tag again. He also used small 1x3 envelopes --that I believe are used by stamp collectors-- to store his seeds. Author's note: don't forget a moth ball or two to keep out the insects. We also drove to Ft. Myers to visit Gordy Fore. Gordy didn't do much hybridizing but he stressed bright colors in his harem such as Blooming Blazes and Red Bomb. As All A Glow was often used as a parent in his crosses, he got a lot of red, orange, and yellow in his seedlings. Gordy advised, "Don't cut down on fertilizing when the show season is over. If you are going to hybridize, you need healthy plants to expect full seed pods." Our next stop was to Dr. Jack's (Doc Hoffman). Doc kept very precise records and stressed the importance of using healthy, well foliated plants when making crosses. He seemed to think that the blooms low on the north side of a bush will set seeds better than other blooms. He also suggested that if you are going to be away from your plants for a while, "take gauze bandage and cut in into squares and put it around the pod. Secure it with a tie wrap around the stem. The pod will ripen and if it falls off, the seed will be inside." Doc's final suggestion was, "if you get a bloom that you like, whether it wins a show or not, get someone to graft a dozen plants for you and get them out to all the growers and exhibitors in the area. Sometimes our babies have a short life span and if no one else grows your cultivar but you, it will be lost." 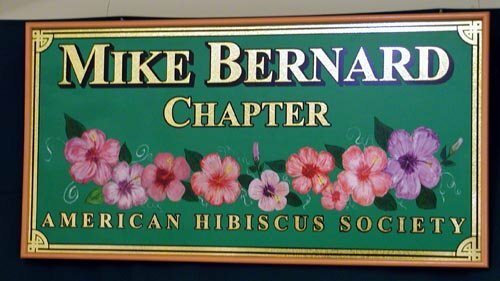 Author's note: for more information on healthy plants, see Charles Black's article on Wilt and Dieback disease in hibiscus. Lastly, we visited Gordon and Evelyn Howard, newcomers to the AHS. Gordon's main advice was to "hybridize every bloom". Every bush in his yard had 20-30 tags on it. He also said that the morning hours were the best time for pollen to be saved. With all the advice we had received, Roberta and I started our stud book in 1976. Roberta was a stickler for putting everything down in the stud book. In 1977, we had our first seedling that we named Thelma Knap (Mildred Rutter x Fire Engine). It was a large, red double. Fritze and Suzzan Rutsky got a gold with it every time they showed. Since the only bloom with a white eye at that time was Lemon Chiffon, we decided to try for a bloom with a solid color petals and a white eye. Three years later, we got Pro Bono (Grey Lady x Cameron), a miniature deep lavender with a white eye. It was an outstanding bloom but had weak parents. We didn't get wood out to the growers and the bush was not strong enough to survive. Our next white-eyed bloom was Rehneric, a metallic yellow with a bright white eye. It was a good bush but a poor bloomer. The Beacon is a deep lavender with a white eye and hybridized more recently, Jupiter Light is a medium red with a white eye. However, the jury is still out on this one! I am still looking for a bloom with brown petals and white dots a la Mini Skirt- and of course I'm looking for one that I can name Roberta. If you enjoyed this article, please click here to read Hybridizing 201 and JE Ludick's Planting Seeds Guide.